Before reading this it would be very helpful to have read part 1: Area Info Window because I won’t be explaining everything covered in that part. These two methods allow you to choose which window you would like to display as opposed to part 1 where it was determined by which map you were on. 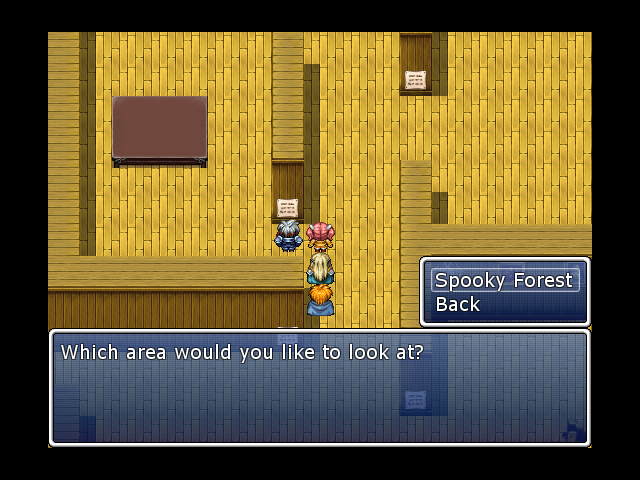 There are multiple cases I have set-up so that i can have different options available as the game progresses. Also at the bottom is the variable that will store the number you can use for Conditional Branches. I set it to 15 and named the variable Choice Selection. This calls the choices directly from the main menu screen. This is a very long common event with just four areas and will get longer the more you add. 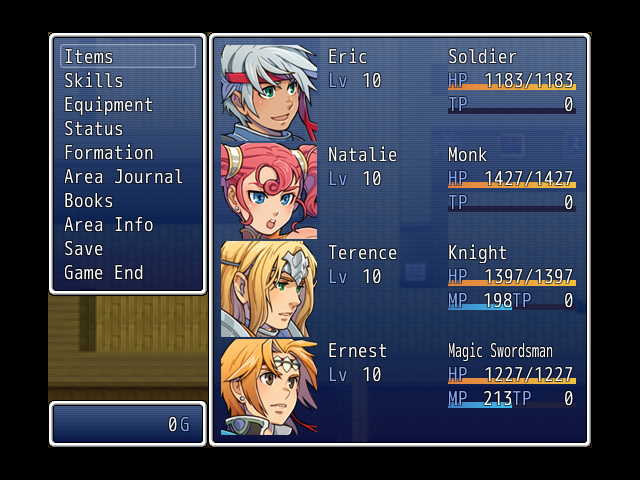 Second, once it determines which choices are available, it allows the player to select which entry they would like to see. Whichever one the player chooses get stored by the MC script in the Choice Selection variable with the first choice as 0, the second as 1, and so on. Then it uses the Jump to Choice Selection command to go to Label: Choice Selection. 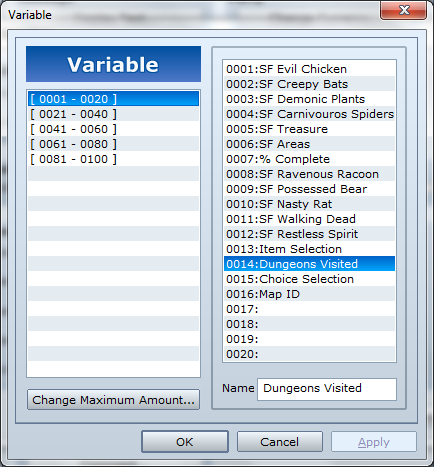 The Back option and the Conditional Branch: Variable [0014:Dungeons Visited] == 0 use the command Jump to End Area Journal to avoid accidentally showing the player an area info window when they cancel or none have been allowed yet. 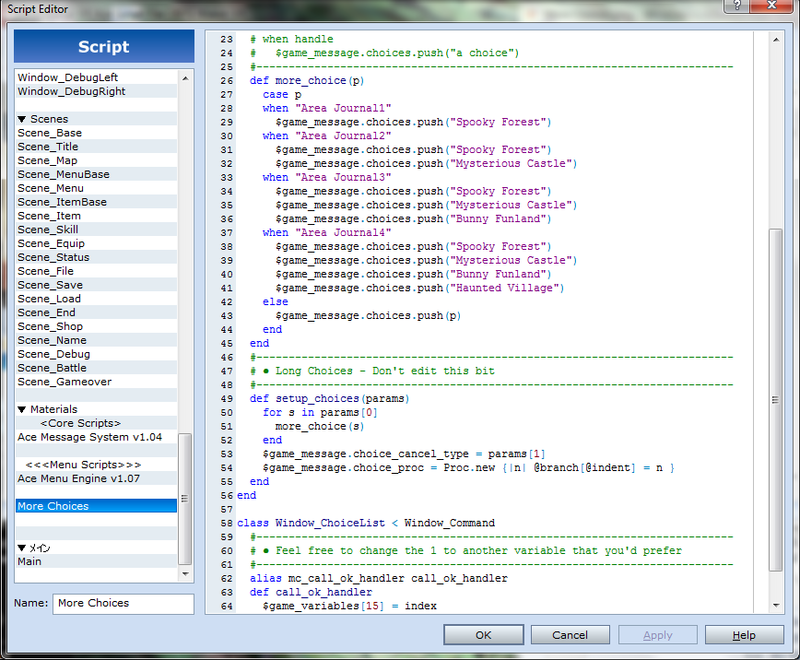 Third, at Label: Choice Selection the Choice Selection variable is checked to determine which window is opened. 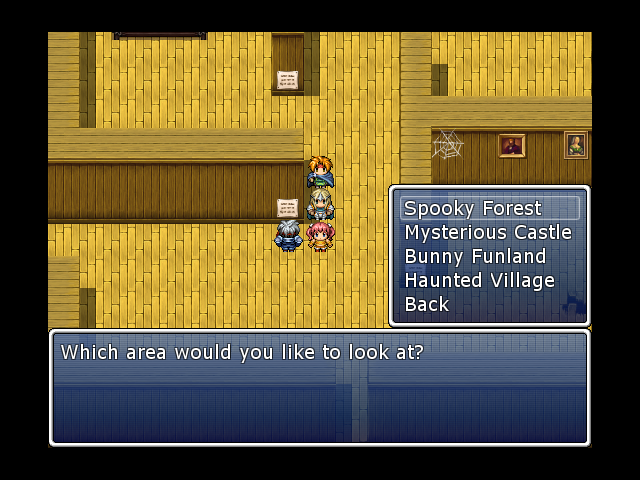 This example uses the common events Spooky Forest Page, Mysterious Castle Page, Bunny Funland Page, or Haunted Village Page. Then, it uses Jump to End Area Journal command to go to Label: End Area Journal. 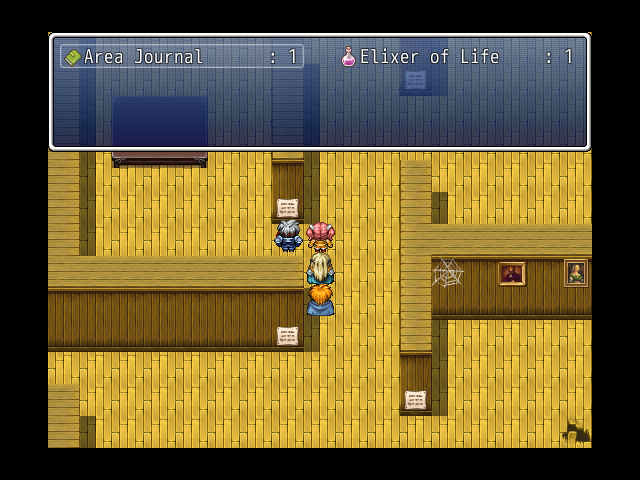 Finally, at Label: End Area Journal it uses the command Open Menu Screen to return the player to the menu screen. Then change all the Jump to Label End Area Journal to Jump to Begin Area Journal that are in the section under Label: Choice Selection. 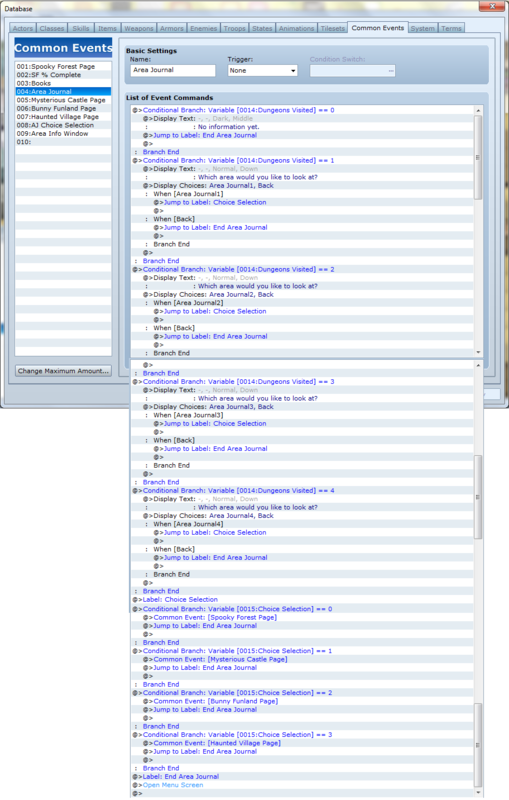 This uses all of the first method, but puts an item selection menu up first so the player can pick which set of info windows they want to see. This helps you control when sets of info windows are available without having to use a second set of choices which can save on variables and add a little visual zing to your event. First, the command Label: Begin Books will be used later on. Second, the variable Item Selection is cleared out so that it will not accidentally bring up the item selection window in case the player picks an invalid item and then cancels. Fourth, the variable Item Selection is checked to determine if it is a valid option. If it is, then it will run the appropriate common event (in this case the Area Journal common event) and then it uses the command Jump to Label: End Books to avoid opening the menu screen again because the Area Journal common event already does. If it isn’t a valid option, then it uses the command Jump to Label: Begin Books to reopen the item selection window. Edit: Formar0153 was awesome enough to make a script that improves the item selection process called: Improved Item Processing. I recommend using it to improve the appearance and reduce the amount of variable values you would be required to check against. Its a really simple script, but I don’t recommend using the all function because id numbers that are stored in the variable don’t distinguish whether it is an armor, weapon, or item. Finally, the command Open Menu Screen is only included to return the player to the menu screen if they hit the cancel button. 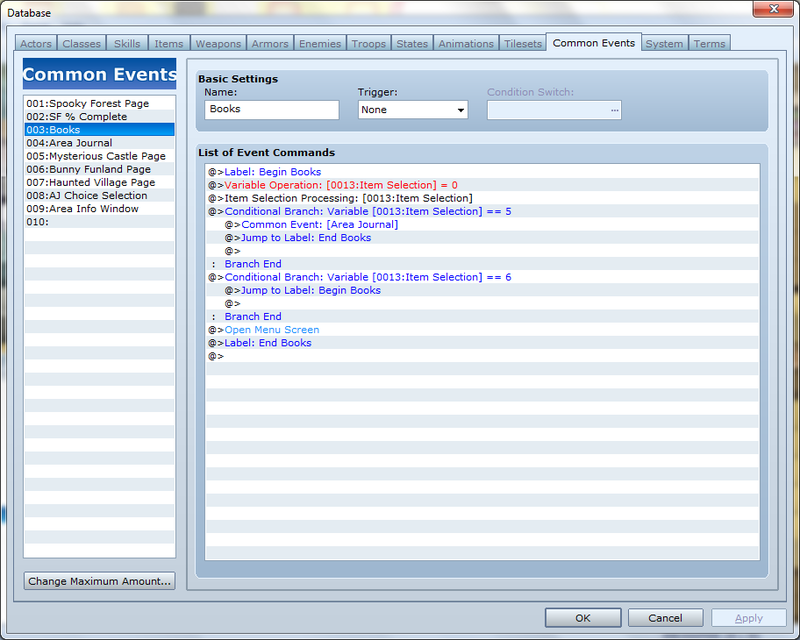 With a little work you could have each common events page tied to a particular item (like the maps in the Zelda series) and avoid using the MC script which would also save you variables and a lot of the conditional branches. I hope you found this series informative. As always if you have questions feel free to ask in the comments section below.